November « 2007 « R-V There Yet? Each day in paradise brings new adventures and learning experiences. 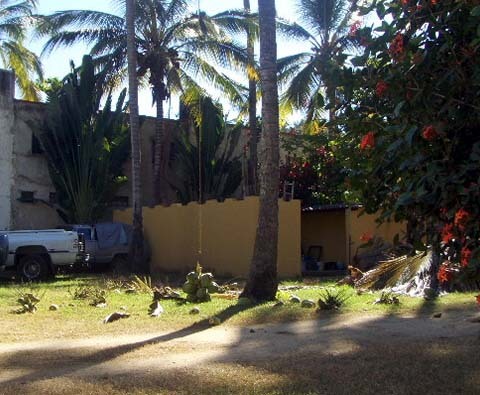 The palm trees at the Sayulita RV Park are quite tall and full of coconuts. 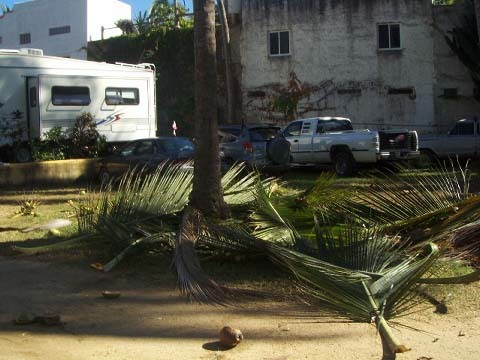 Rather than have the coconuts ripen and drop down on cars or rvs, each year they must remove them and trim the palm fronds that tend to turn brown. You can imagine dropping a bowling ball on top of an rv or parked car from sixty feet in the air. That is the kind of damage that a coconut can inflict. Today, David, a local that works at the park, trimmed three of the 78 trees on the property. He hooks a rope and a machete to his belt so that he will have them when he reaches the top. Barefoot, and without the use of any climbing gear, he prepares his assent by praying and crossing himself at least four times. He reaches the top in a matter of seconds. I can’t even imaging enough money to get me to try that. Fortunately, I wouldn’t make it more than a few feet from the ground. 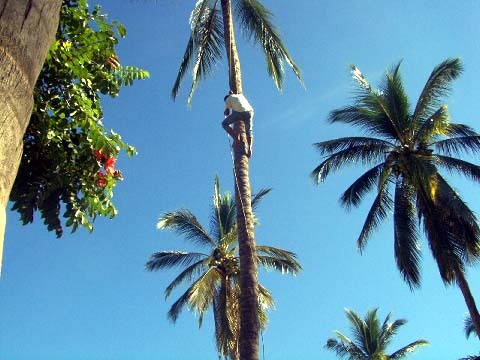 Upon reaching the top he scrambles around the top of the tree and goes to work on the coconuts and other trimming. As the litter drops, it makes quite a mess. If a bunch of coconuts fall, some will explode and shower the area with the juice. Large bundles of the nicer coconuts are lowered to the ground using his rope. Below are the palm fronds that are being saved to take to somebody that will make brooms out of them. 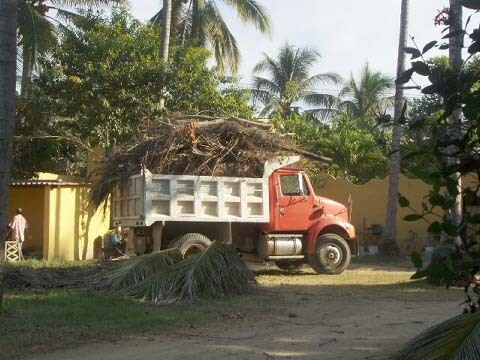 The truck in the picture has a pile of stuff that was cut from the trees last week. We thought that it would take at least three loads to haul the stuff away, but with two guys in the truck hauling stuff up and two lifting from the the ground, they somehow managed to squeeze, chop and weave everything into one load. 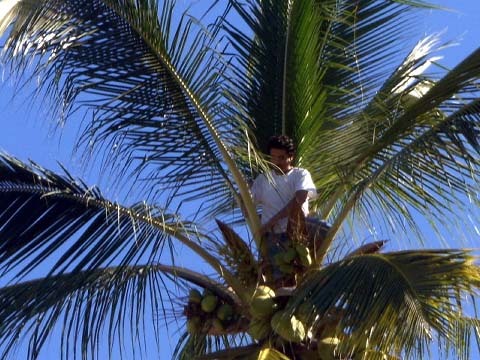 We noticed some of the workers drinking from the coconuts. We asked if we might give it a try. David whacked a flat bottom on a coconut and whittled at the other end until, with his last whack, he popped a little hole in the top. We were amazed to pour out well over a quart of liquid into a bowl. We drank it and survived. It was actually pretty good. I suspect that, with the addition of some rum, it would be fantastic. 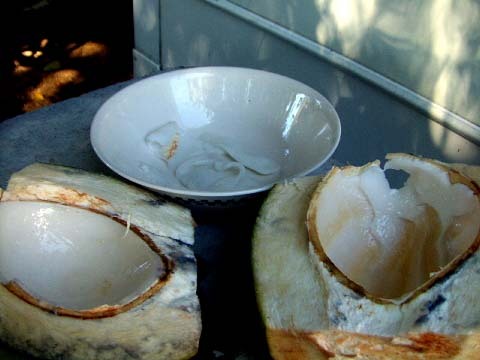 Next we asked to have the coconut cut in half so that we could try the meat. We were curious because the coconuts were still green, not the brown, hairy things that you expect to find. I’ll preface this by saying that I really can’t stand coconut. We found the meat to be the consistency of softened cheese and remarkably good tasting. It’s hard to see, but we spooned some of the meat into a bowl. Having exhausted ourselve watching David work, we decided it was time for the beach. Tinka stops beside a pile of the keeper coconuts from one tree. Out to the beach where, yesterday, they had some of the best waves for surfing in a few weeks. Today, not so lucky. The scenery to the north of our location looks pretty much unchanged. To the south, however, the tide had gone out revealing an enormous rock field. The areas to each side of the center of these rocks are the best areas to surf, depending upon which way you want the wave to break. 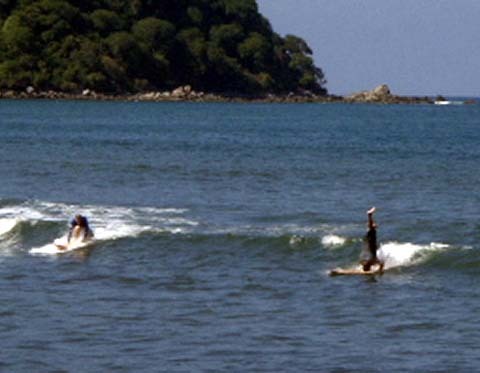 We were told by a surfing friend of ours that they come dangerously close to the rocks just a short distance from them when they lose their vertical stance. As we sat there, along comes a guy with five horses trying to drum up riders. 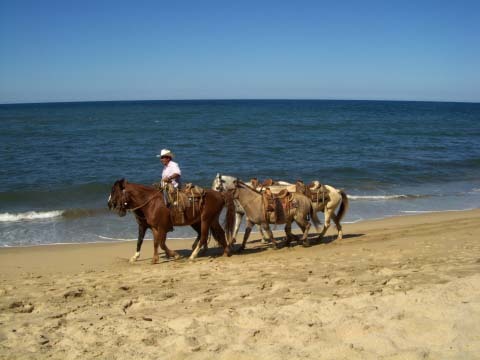 We see several horseback riders on the beach. I don’t know how good sea water is for horses. The scenery is always changing. 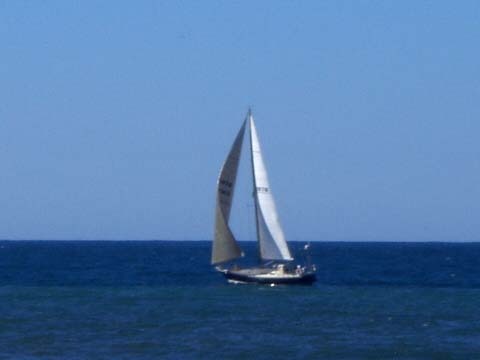 Today we were treated with the appearance of a sailing yacht. They cruised around in the bay for most of the afternoon. Later in the day, they anchored near the center of town for the evening. Along comes a gal that may have stolen Tinka’s swim suit. Well, the bottoms anyway. Well, living in paradise is anything but boring. From the earlier post you can see how beautiful the beach was on Thanksgiving Day morning. Well, as the day wore on, it became urgent to find a sports bar from which to watch the Dallas Cowboys take on the New York Jets. 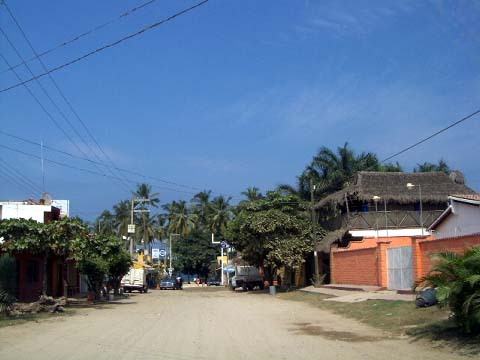 We hopped on our bicycles and headed along the road closest to the beach, toward the center of town (Sayulita). We had heard that we could find the NFL on a television at Don Pedro’s. The word was correct. We perched ourselves at the bar to get a good view of the television. As expected, our Cowboys performed admirably and dominated the game. During intermissions, it was nice to be able to look over our shoulders at the extraordinary view behind us. Over the left shoulder were several beachgoers with their army of umbrellas. Over the other shoulder were dozens of surfers waiting for that perfect wave. Don Pedro’s was planning a traditional turkey day feast for the Thanksgiving night meal. 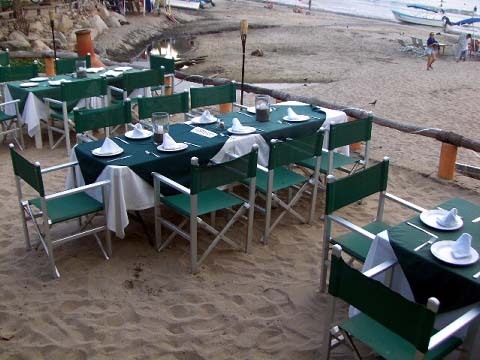 ($35.00 USD per person) Here are the tables prepared for the event. We opted for less expensive fare. We headed out on our bicycles to the main square in town. 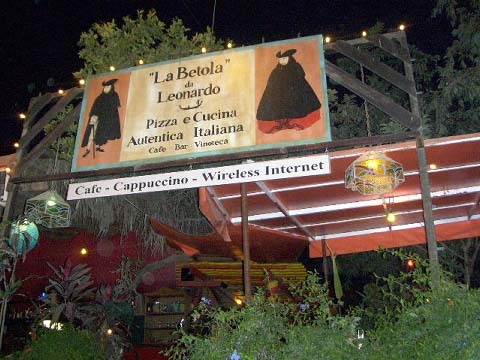 (which is really a triangle) We spotted La Betola, an Italian restaurant that promised excellent pizzas. All of the pizza places in town, and there are several, use the old style fired brick ovens. In general, the pizza was pretty good except for that one little thing, price. What we would consider a medium pizza with sausage, mushrooms and pepperoni came to $20.00 USD. Where is a Papa Murphy’s when you need one? As you can see from the photos, it was getting dark when we left the restaurant and hopped back on our bikes. We have no headlights on the bikes so we decided on the most direct route home. This path took us through the center of town on cobblestone streets. Having not learned to support most of her weight on the pedals, Tinka says ouch. We headed home to await another day in paradise. We want to wish a Happy Thanksgiving to all our family, friends and new readers. But you can still get burned. 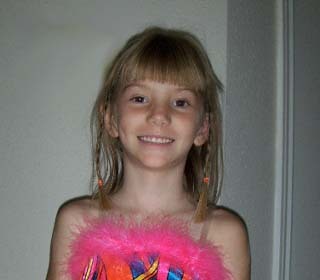 Happy Birthday to another granddaughter. Happy 7th Birthday, Ayden !!!!!!!!!! Also, Happy Birthday to our daughter-in-law, Kiri. We have had a spike in readership because we are listed in www.hitchitch.com . That is a list of people who write blogs while living in their RV. So we want to welcome our new readers. We do not write a journal article every day. We try to do it every 2 or 3 days. We started out trying to write every day but it became too much like work, pressure and being on a schedule. You can make comments at the bottom of the journal entry or you may email us at tinka@tinka.net for a private message, comment or question. We do have a spam blocker so make the subject a title we can spot as a legitimate email. So again, welcome readers!!!!!! For the past couple of days Tinka has been doing nothing but sitting in her recliner and taking pain pills. We think it must have been kidney stones. Hope that doesn’t hit again as that was very painful. 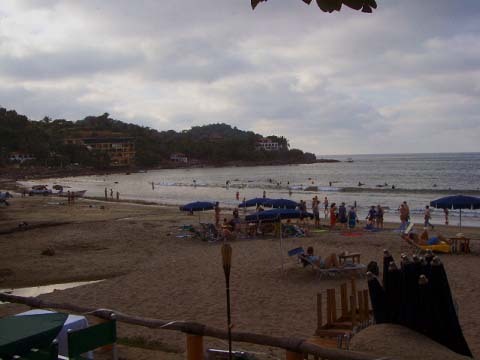 Now we can get back to investigating Sayulita and sitting on the beach. Yesterday, for supper, Rick walked down the block to an open air store. The lady cooks chickens every day on a grill outside. 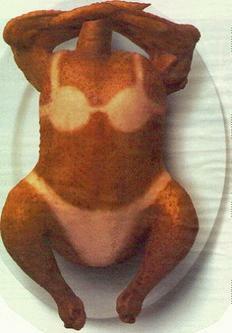 We bought a whole cooked chicken just like you can in the supermarkets in the states. Oh, so much better though. It was so delicious. She split it open and cooks it on the grill that way. When it was done she cut it up in pieces, put the most delicious sauce on it and put it back on the grill for a few minutes. Cheap? No way!!!! We usually buy cooked chickens in the supermarket in the US for about $6. This chicken cost $7. 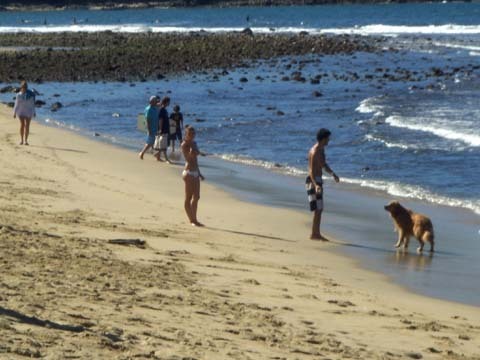 There are no bargains near the beaches in Mexico.We’ve spent our share of time at the beach at the Sayulita RV Park. Most of our time there is reading and taking in the sights. This is a view towards the north of the park. 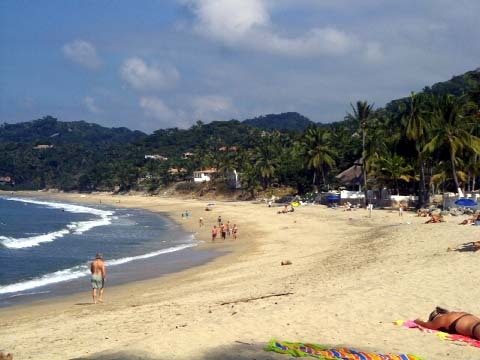 And to the south toward the town of Sayulita. We see workers at grocery stores wearing painter type masks to keep from spreading their germs on the food. They usually have them on their chin though, not doing any good. Anyway, I spotted a guy laying on the beach with what looked like a painter mask on his face — Alas, after closer examination, no. 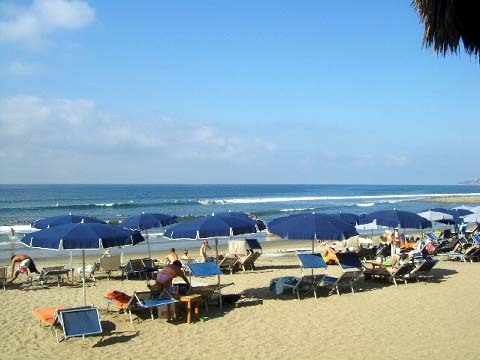 Sayulita is a pretty famous surfing beach. We haven’t seen any spectacular waves yet, but there are several surfers taking short rides. One heavy set guy, (there’s hope for those of us so inclined), shows off his talents. Here he is jumping on his board and he turns backwards and then forward again. Here he is doing a head-stand. It turns out that he is a jack of all trades. He teaches surfing, he’s an artist, and has several other “vocations”. We still have an issue with our truck. The “brake” light comes on when driving. It is probably an adjustment to the emergency brake switch. We’re trying to get hold of the guy that worked on them. 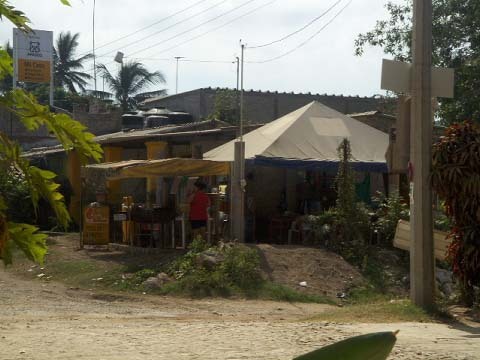 On Friday morning we left La Peñita and headed off on our last 20 miles toward our original goal destination, Sayulita. 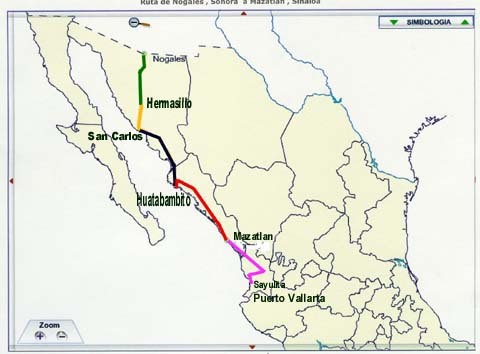 Here is a map of our plan that didn’t include our slight, 6-night, interruption. 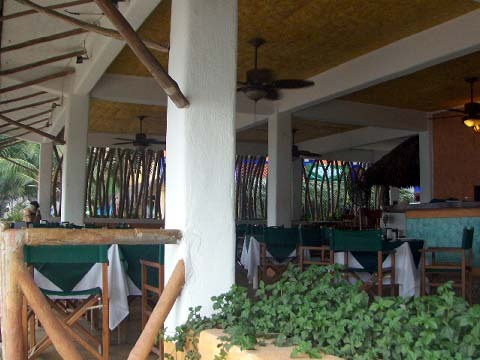 Sayulita is a really interesting coastal town in the southern part of the state of Nayurit. We’ll provide better information about the town after we get a little more familiar with it. 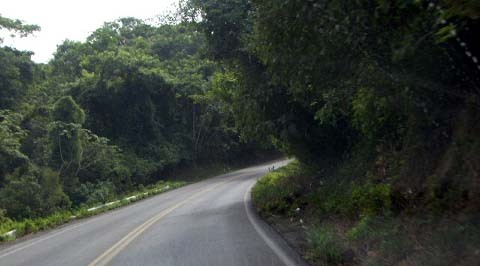 Not a surprise, but the road was jungle covered, curvy and narrow. The surprise was that our trip was pretty uneventful. 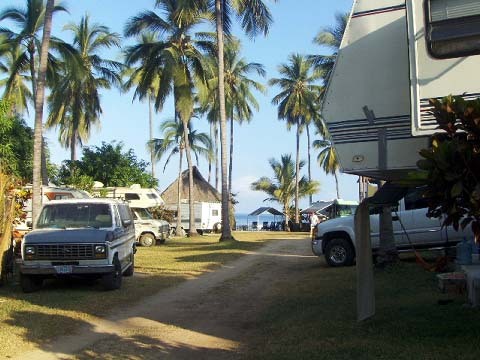 During the week we had traveled, with some acquaintances, to take a look at the RV park because we had heard that finding the entrance road was a little tricky. It is a good thing that we did, because if we had missed it pulling our rig, we would never have been able to turn around. Here’s a shot of the road heading to the park. It ends at the ocean. 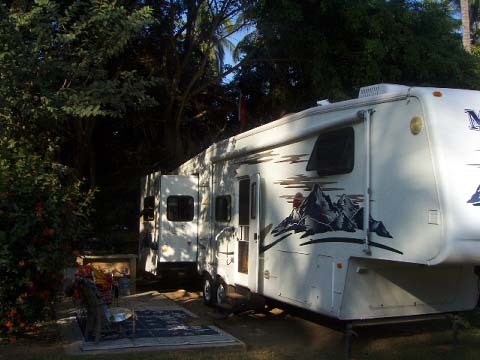 When we scouted out our rv site, on the earlier trip, we noticed that the trees were really low and there was no chance that our trailer would fit. The park was made several years ago and it wasn’t designed with rigs our size in mind. 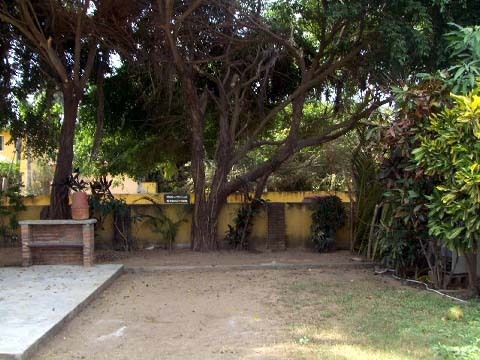 We contacted the on-site manager and he said that he would get the trees trimmed prior to our arrival. The job was completed and the lot cleared with room to spare. The next obstacle was maneuvarability. This is a shot from in front of our site toward the ocean. As you can see, things are a little snug. Getting into the site required a trick that we hadn’t tried before. We pulled ahead and backed into the spot as best we could. We were really crooked with the nose of the 5th wheel toward the ocean. We decided to unhook the trailer, reposition the truck so that it was facing to the right and re-hook up. This allowed us more room to move. Another surprise, it worked!!!!!!! We were able to straighten things out and get ourselves in place. We may never get out, but we don’t have to worry about it for about two months. Someone else is due in this spot on January 10th. You are currently browsing the R-V There Yet? blog archives for November, 2007.